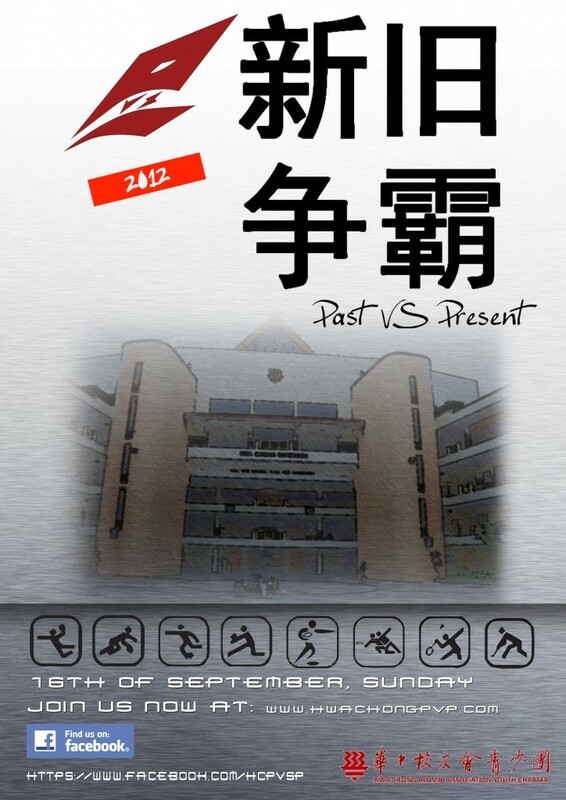 PvsP 2012 will be held on 16th September 2012, Sunday. 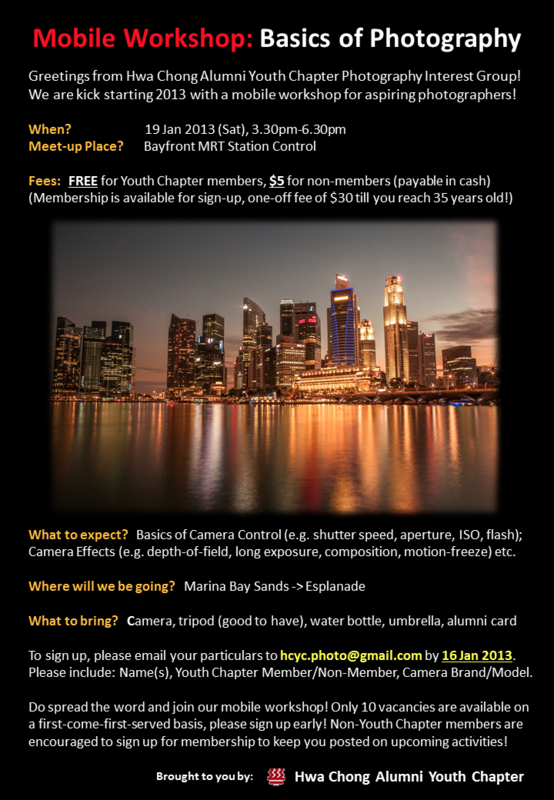 Come down for a day of excitement, reminiscence and fun! Wong Keng Siong joined DBS Bank as Senior Economist in the bank’s economics research team in September 2005. He moved to the Country Risk Management unit in April 2007 and assumed his current position as unit head in October 2007. As SVP & Head of Country Risk Management, Mr Wong’s responsibilities include the assignment of country and sovereign risk ratings, management of country risk exposures and the implementation of the Country Risk Management framework in the DBS Group. 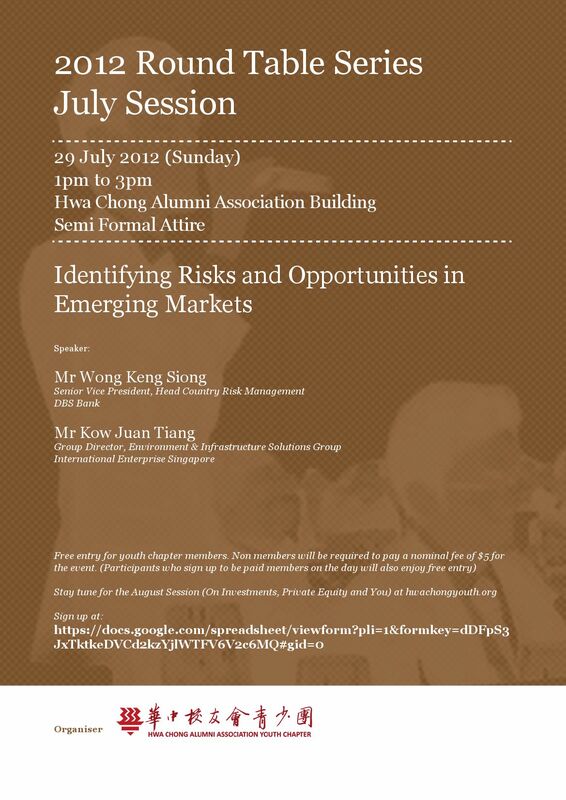 Mr Wong was senior economist at the Monetary Authority of Singapore, before moving on to the private sector in 1992. He worked for a number of top international financial institutions, such as Yamaichi Securities, the Dai-Ichi Kangyo Bank and the Bank of Tokyo-Mitsubishi, prior to joining DBS Bank. Mr Wong is not only a well- quoted economist – due to his extensive experience in covering the Asian markets – his insights are highly sought-after at the policy-making level as well. Mr Wong has an MBA from University at Buffalo and a Bachelor of Business Administration (Honours) from the National University of Singapore. 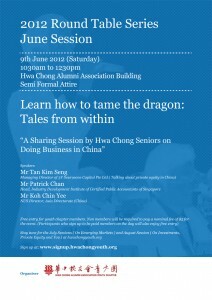 As part of our efforts to create networking value for our Alumni Members, the Youth Chapter is organising the 1st Roundtable Forum for 2012. This time, we explore how to break into the China market for business and what minefields to avoid. 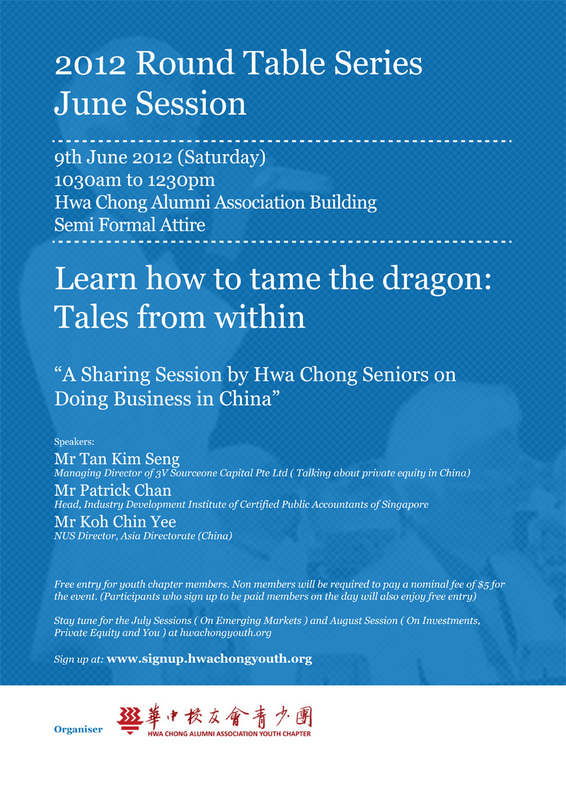 So grab your Chinese High / Hwa Chong buddy and join other like minded Hwachongians in this networking event! Mr Tan is a Managing Director and co-founder of 3V SourceOne Capital, a regional growth equity fund manager. He is currently the Honorary Treasurer of the Singapore Venture Capital and Private Equity Association. He is an Adjunct Associate Professor with the National University of Singapore and serves as the co-head for the Launcpad Project Course with the Institute of Engineering Leadership. He has been involved in venture capital investments in Greater China, USA and ASEAN since 1994. He was previously an Executive Director and Principal Fund Manager of UOB Venture Management responsible for fund management activities and setting up of joint-venture VC funds in China. Mr Chan was headhunted for his current position, heading industry development at Institute of Certified Public Accountants of Singapore (ICPAS) where he oversees the development of accountancy as a financial and business services sector, with the 2020 vision to develop Singapore into a global accountancy services hub for Asia Pacific. 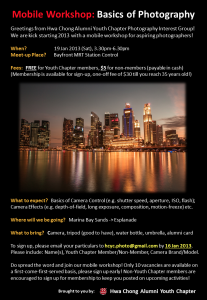 Prior to ICPAS, Mr. Chan was the Director of Industry Development at Singapore Business Federation (SBF), the apex business chamber in Singapore with more than 17,000 companies. Mr Koh is currently Director, Asia Directorate (China) in the Office of Vice President (University and Global Relations) for National University of Singapore. He graduated in 1994 from NUS with a BA (Hons) Degree in Chinese Studies, and with a MBA, also from NUS, in 2001. He held appointments in news and media relations as well as China affairs in several government bodies before he spent a few years as general manager in companies and chamber of commerce in China, and Business China Singapore. He is a columnist for Lianhe Zaobao and other media. Register for the roundtable now! 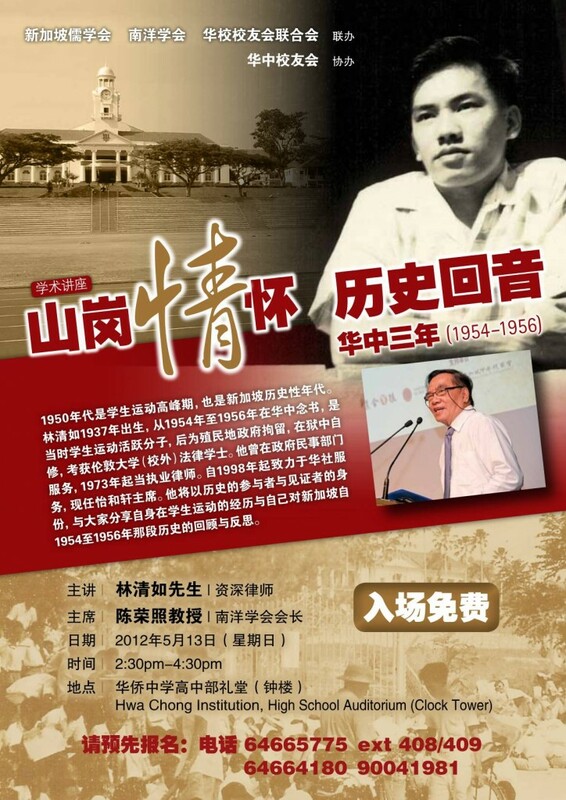 Come listen to Mr Lim Chin Joo, brother of Mr Lim Chin Siong talk about his days in Chinese High as a student activist. Come experience the passion and brotherhood our Chinese High seniors have for the school and the part they play in our country’s nation building.